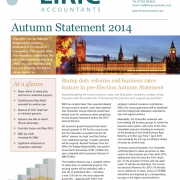 LIRIC are pleased to attach our guide to the Autumn Statement 2014. LIRIC’S guide offers a summary of the key business, tax and financial measures that were unveiled, along with some of the forthcoming changes that may affect you. It was an interesting statement, clearly some political motivations with the general election looming. It was positive to hear the economy is doing well, in fact better than expected. There are some radical and interesting changes including the headline grabbing changes to stamp duty on residential property. Other major topics include an additional increase to the personal income tax allowance, and a review of business rates. For tailored advice on any of these topics, and how they may impact your business or personal finances, please give us a call on 01763 853633 or email lisa@liricaccountants.com. Remember, LIRIC offer more than the traditional tax and compliance requirements: we can advise you on strategies designed specifically to minimise your tax bill, improve profits and make the most of your personal wealth. LIRIC look forward to hearing from you.